Peter Banks, 1947-2013, was a musical everyman who missed the brass ring early in his career. During the mid 1960’s, Banks was a part of a number of mostly forgotten bands; The Nighthawks, Devil’s Disciples, and Syn. By the time he migrated to Mabel Greer’s Toyshop, his bandmates were vocalist Jon Anderson, drummer Bill Buford, and keyboardist Tony Kaye. It was an easy jump to the formation of Yes. Banks left during the recording of their second album die to creative differences and the rest, as they say, is history, at least for Yes. Banks would eventually settle into a solo career that produced cutting edge and creative progressive rock, that was just outside the mainstream. While he remained widely respected, large commercial success would elude him. 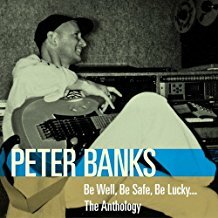 Be Well, Be Safe, Be Lucky is a two disc, 30 track release to mark the fifth annivsary of his death. While it is a compilation drawn from his solo career, the song selection is eclectic, bordering on odd at times. The release lacks cohesiveness, which helps regulate it to a niche release, primarily pf interest for fans of Banks. There are a number of tracks that just feature Banks on guitar. “All Points South,” “Fogbound,” and “No Place Like Home” have a raw feel but demonstrate his style. When he is backed by a band, the music has a more finished feel, “Knights (Reprise)” with Phil Collins, Steve Hackett, and John Wetten and “Knights (Revisited)” with Tony Kaye, Billy Sherwood, and Jay Schellen present his musical visions. Much of the second disc find him playing all the instruments with varying degrees of success. During his career Banks released a lot of interesting music but continually seemed to be searching. Be Well, Be Safe, Be Lucky is an album of bits and pieces that that has individual high points but is never consistently satisfying.